WHAT IS MOUNTAINTOP REMOVAL COAL MINING? Before mining can begin, all topsoil and vegetation must be removed. Because coal companies frequently are responding to short-term fluctuations in the price of coal, the trees are often not used commercially, but instead are burned or sometimes illegally dumped into valleys. Many Appalachian coal seams lie deep beneath the surface of the mountains. Accessing these seams can require the removal of 600 feet or more of elevation. Blowing up this much mountain is accomplished by using millions of pounds of explosives. Coal and debris are removed using enormous earth-moving machines known as draglines, which stand 22 stories high and can hold 24 compact cars their buckets. These machines can cost up to $100 million, but are favored by coal companies because they displace the need for hundreds of miners. In 2002, the Bush Administration changed the definition of “fill material” in the Clean Water Act to include toxic mining waste, which allowed coal companies to legally dump the debris, called “overburden” or “spoil,” into nearby valleys. These “valley fills” have buried more than 2,000 miles of headwater streams and polluted many more. Coal must be chemically treated before it is shipped to power plants for burning. This processing creates coal slurry, or sludge, a mix of water, coal dust and clay containing toxic heavy metals such as arsenic, mercury, lead and chromium. The coal slurry is often dumped in open impoundments, sometimes built with mining debris, making them very unstable. While reclamation efforts are required by federal law, coal companies often receive waivers from state agencies with the idea that economic development will occur on the newly flattened land. In reality, most sites receive little more than a spraying of exotic grass seed, and less than 3 percent of reclaimed mountaintop removal sites are used for economic development. According to a U.S. Environmental Protection Agency impact statement on mountaintop removal in Appalachia, it may take hundreds of years for a forest to re-establish itself on the mine site. 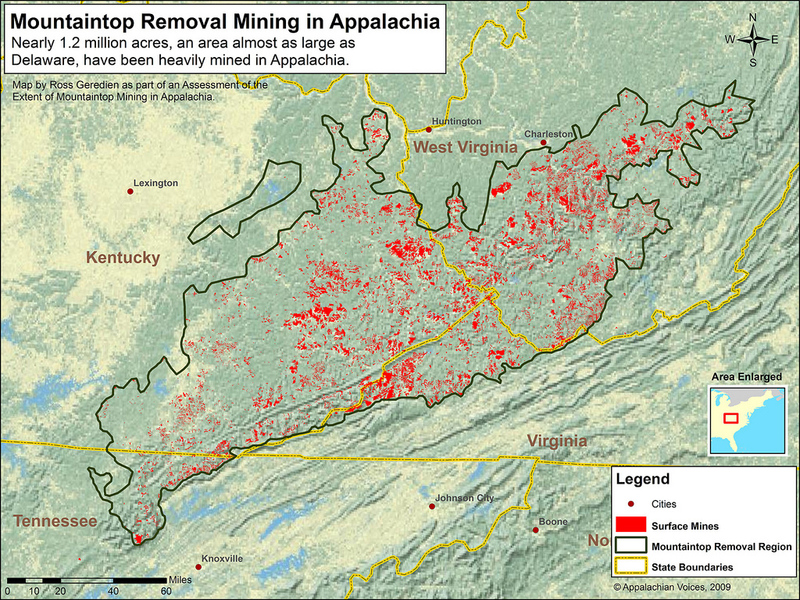 Where is mountaintop removal happening? Mountaintop removal takes place primarily in eastern Kentucky, southern West Virginia, southwestern Virginia, and eastern Tennessee. A study in 2009 showed that nearly 1.2 million acres to date had been surface mined for coal, and more than 500 mountains destroyed by mountaintop removal coal mining. In some counties, such as Wise County, Va., surface mining has impacted nearly 40 percent of the land area. What are the effects of mountaintop removal on families and communities? Families and communities near mountaintop removal sites are forced to contend with continual blasting from mining operations that can take place up to 300 feet from their homes and operate 24 hours a day. The impact of blasting not only makes life all but unlivable in nearby homes, it also frequently cracks wells and foundations. Blasting can send boulders flying hundreds of yards into roads and homes. 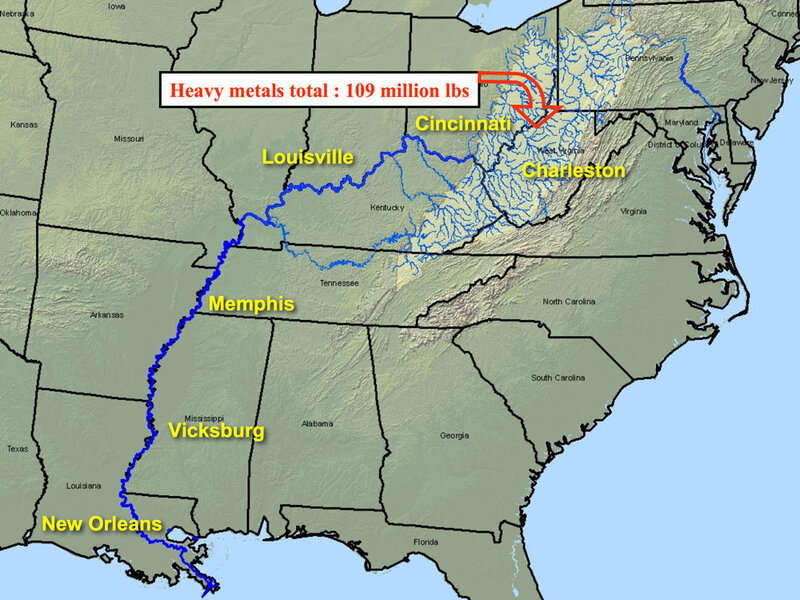 How does mountaintop removal affect the environment? Mountaintop Removal is occurring right at the heart of one of the nation’s main hotspots of biological diversity. According to the Natu Conservancy, the mountain region including southwest Virginia, southern West Virginia, eastern Kentucky and northeastern Tennessee contains some of the highest levels of biological diversity in the nation. This region is also at the headwaters of the drinking water supplies of many US cities. 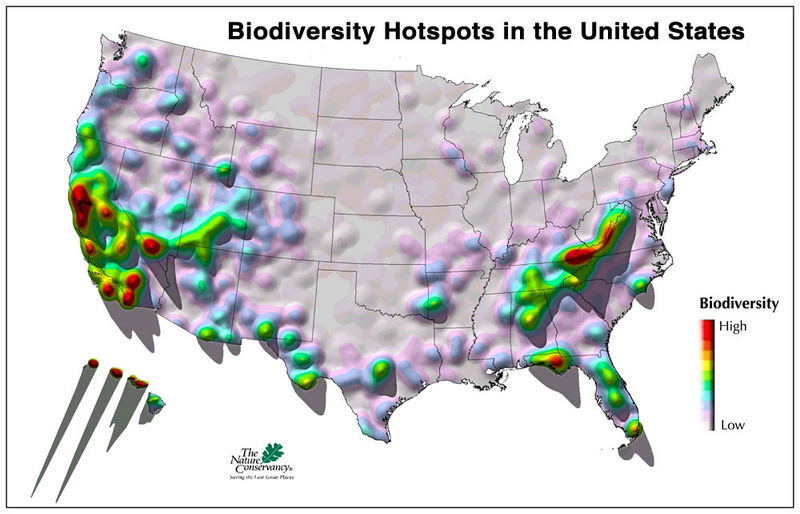 The maps below show hotspots of biodiversity based on a rarity-weighted index biological diversity produced by the Nature Conservancy, as well as the major river systems with headwaters in the Appalachian coalfields. While the EIS did compile a lot of disparate information on the effects and extent of MTR, the analysis was based on mining permit maps. According to satellite analysis done by Michael Shank at the TAGIS center of the West Virginia DEP, however, those permit maps are underestimating the extent of valley fill in 6 West Virginia coal counties by about 40%. Thus, the entire EIS is based on verifiably faulty data. More than 7 percent of Appalachian forests have been cut down and more than 1,200 miles of streams across the region have been buried or polluted between 1985 and 2001. Over 1000 miles of streams have been permitted to be buried in valley fills. (for scale, this is a greater distance than the length of the entire Ohio River). Mountaintop removal mining, if it continues unabated, will cause a projected loss of more than 1.4 million acres by the end of the decade-an area the size of Delaware-with a concomitant severe impact on fish, wildlife, and bird species, not to mention a devastating effect on many neighboring communities. 800+ square miles of mountains are estimated to be already destroyed. (this is equal to a one-quarter mile wide swath of destruction from New York to San Francisco – it is also significantly underestimated). Where can I learn more about mountaintop removal? The organizations partnering on this website and our allied organizations have many further resources on the web about mountaintop removal. Click here to see a list of links to those organizations.